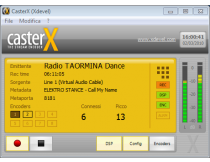 CasterXCasterX is an advanced multi-stream audio encoder. It supports Windows Media, Shoutcast and Icecast servers and WMA, MP3 or AAC format. In addition to providing stream hosting services, Stream Solution offers a range of services for Internet radio about to be born and who wish to be guided in the process that will lead to broadcast on the web. Stream Solution can provide integrated software solutions such as the system of directed radio, audio processor, or encoding software. CasterX captures the sound from your sound card, microphone, line in and sends it to your listeners, all in real time. In a few clicks of CasterX you reach your online audience.